My main tasks now are weeding and fertilizing. For weeding, I just pull them with my hands (or a hoe) and leave them right there as a mulch. For fertilizing, I usually spray a combination of effective microorganisms/scd probiotics and liquid seaweed and liquid sea minerals and blackstrap molasses. My forest garden is still a baby, but looks a little more jungle-like all the time. You can read about those at the links above. As for what do I do for the rest of the year when I’m not doing stuff for SmilingGardener.com, it differs every year. This year I’m working on a new project about how to improve your health and happiness – nutrition, fitness and your mind. I’m not doing this alone because I’m not an expert in any of these things, but I’m finding experts in various fields and working with them. Today, what I really wanted to do was say hey, it’s been a while, I hope you’re having a good summer. And as I prepare for this new project, I’d really like to learn more about your approach to nutrition, exercise, and happiness. So for nutrition, what sort of guidelines have you created for yourself that you try to follow, and also, what questions do you always find yourself struggling with? By the way, I’ll be talking to naturopaths, nutritionists and dietitians this year, and I’ll be interested to bring your questions to them. And for exercise, what do you do there? What questions do you have there? I’ll be talking with personal trainers and physiotherapists and chiropractors. For your mind, what do you do to relieve stress or anxiety, or just to be happy? What questions do you have there? I’ll be talking with therapists and psychologists and meditators and so on. And what questions do you have about all of these things? Hi PhilHave you ever encountered or heard of squash plants not producing? I have planted the yellow crook neck squash this year and have had many blooms. I’ve fertilized with your products, using the same things you’ve mentioned in your article above. Normally, my squash plants will produce “vegetables” immediately after the blooms. But, this year, the plants are not producing. My plants are healthy and growing … no pest problems, no weeds I’m confused. Squash have male and female flowers. The male flowers start blooming before the females, so it could be that your females just aren’t blooming yet. But if they are, it could be a lot of things – weather too hot, not enough water, too much nitrogen, pests or disease, etc.Or it may be a problem of the females not being pollinated. That’s the job of insects, who travel between male and female flowers doing the pollination. But sometimes that doesn’t happen, for various reasons, such as a lack of pollinators.Fortunately, you can do it yourself. It will probably be best if you search online to find some photos of how to do it, but in short, you want to pick a male flower that is mature (should leave yellow pollen on your finger when you touch the stamen), remove the petals, and rub it inside the female flowers, touching the male stamen to the female stigma. Voila – pollination! Some years there are hardly any female flowers, but I hand-pollinate those that do appear. I enjoy hiking. What are the best strength-training exercises to do to strengthen legs if you don’t belong to a gym or have machines? I say love mantras every day that I learned from Christine Arylo since I took her Choose We Before Me class which is really excellent. We can’t be happy all the time because negative feelings are normal and sometimes we can use them as a sign that in some area, we need to take action to change things. I eat whole food plant-based 100% of the time and drink water and as a result I have great cholesterol and no weight issues. Hiking, love mantras, whole food plant-based diet with lots of water – thanks for sharing. And good question about strengthening legs – there are some great body weight exercises you can do and I’ll be excited to talk to a personal trainer about that. Walk/weights/water, protein/fruits/veggies/nuts, decreasing sugar/carbs, lots of activities – thanks for sharing! Powdery mildew on the squash family seems to happen in most gardens, including often in mine at the end of the season – it’s something I don’t worry about as long as the fruits are producing. Regular applications of microbial inoculants such as the SCD Probiotics I mentioned up above can be helpful there. Curling cucumbers can be caused by a lot of issues. Actually, it can be similar to the reasons that squash sometimes don’t fruit, which Patrice already mentioned in the comments on this page. Thanks for your enjoyable videos. I love Organic vegetable and fruit gardening and get most of my exercise in the garden and with martial arts. I especially love growing grapes Organically.I eat mostly Organic foods including Organic beef and chicken. I stay away from all GMOs. If I even vaguely suspect something has a GMO ingredient, I do not buy it or use it.Meditation is quite beneficial for keeping healthy and in touch with a deep source within (“Insight” or “Vipassana” mediation). Ten-day mediation retreats are especially beneficial. Gardening/martial arts, organic non-gmo, meditation – thanks for sharing Steve! I did Vipassana back in April and am still benefiting from it every day. Hi Phil!Food:Completely grain free – I learned by reading Lynn-Genet Recitas’s book, The Plan, that I’m very sensitive to all cereal grains and mildly sensitive to others. This cured my 35+ year IBS literally overnight. Btw, no doctor had been able to help me. So yay.Oodles of fresh, organic vegetables, both cooked and raw. Pasture raised eggs, chicken, and beef. Some whole, organic fruit but not a ton. Flax seed granola I make myself. Fresh coconut milk I make from the coconut. Lots of yummy fats like butter from pasture raised cows, olive oil, and raw nuts and seeds.Drink:Bullet proof coffee (google it – super yum). Filtered water. Herbal tea. Wine. That’s about all that crosses my lips.Exercise:I live in San Francisco so I walk as much as I can, taking the hilly routes and tracking via a hill tracker I found online. Makes it kind of fun, to see how high I can climb on my way to and from the grocery store.Mind and Spirit:Sorely neglected. Trying to find balance. No grains, yes organic vegetables/fruits, pasture-raised animals, several types of drinks, walking, need some balance on the mind and spirit – thanks for sharing Sarah! Ya, for some people grains are excellent and for others they can cause big issues. Other than essential oils, my favorite general purpose being Tea Tree:I’ve pretty much given up on Sugar in favor of “Stevia In The Raw”. In SE Texas I can sometimes get some of the plants to grow well on the east side of my house. I have not been able to reproduce via cuttings. Any suggestions on how to reproduce Stevia and how to best use my plants/leaves as sweeteners?Chia Seeds, promoted as a compact source of energy, have become an addition to my morning bowl of cereal. I’ve planted some of the seeds and ended up with plenty of pretty small blue flowers on 3′ tall plants. When trying to harvest any seeds, almost impossible to sort the (few) seeds from chaff. Any suggestions on gathering these and other small herb seeds?I make and consume Colloidal Silver made with distilled water, silver rods and purchased battery powered ‘generator’. I can not verify it’s benefits but do believe that it has helped my dog overcome bladder infection. Some people swear by it but I question if I bought into a myth? Good questions. I’ve never grown stevia or chia outdoors up in my neck of the woods. I don’t have much trouble separating the chaff from bigger seeds like cilantro and dill, but I’m not sure about chia. I know it’s best to pull the whole plant and knock it into a container to get the seeds to drop, but not sure how much chaff drops with it. Eat, drink, excercise, think is all about us. We born, we die. All that remain is what we do for the comunity. It is true we need firt to be strong in order to help but not forgeting meanwhile the final taget. We are gregarious beings. You’re right, we need to take care of our communities and need to take care of ourselves in order to do that. Phil, i enjoy the site!I live in a ski resort town in b.c and well that’s a huge thing, city life, I wont do any more, not worry about $$$, live off your land and recycle and be as good to the land as you can.I ski tour, ski, hike, bike, swim, eat all organic, everything I can grow in my garden, no gmo!working or looking at the garden daily is a healthy thing, yoga, enjoying the Columbia river, or the view from a top the mountains.just try and enjoy life in the bush or in your garden! a born and raised green thumb! 1. Organic fruit, vegetables, grains and yogurt + fish. No meat.2. Walk, hike, tennis, weights and calisthenics. 3. Meditation, music and reading. Most favorite thing: The ocean.4. I’m pretty settled on these but will review comments below for ideas. How about yoga? Whole foods, exercise and lots of great practices for the mind – thanks for sharing! Hi Phil, just wanted to let you know how we enjoy your letters and tips. Just an fyi. It’s August here in the south and really hot! I’ve done quite a bit of study over the last 5 years on the subjects you are asking about including building our soil so that our produce has the highest nutrient content possible. I mostly drink water and I add liquid minerals to that. I do drink some herbal teas and I juice about 3x per week. I have a smoothie most mornings for breakfast. I eat an 80/20 diet where 80% is raw produce and 20% is grains and protein (only whole grains, nuts, chicken, fish, and rarely pork and beef). I start my day with 1/2 squeezed lemon in warm water as a daily liver detox. I eat all things raw and when I do preserve, it’s through (in order of frequency) dehydration, freezing, and some canning. I take live probiotics, prebiotics, and food enzymes (mostly fresh papaya seeds). Currently, I am really enjoying a liquid vitamin supplement called Source of LIfe. I also drink 2oz per day of an antioxidant drink called Ningxia Red. I take these supplements because I know the soil our food is grown in lacks nutrients across the board. I try only to eat organically grown foods. I am currently reading a book called, “The Iodine Crisis” which is very interesting and I just started adding iodine drops to my morning smoothie today! I incorporate herbs and therapeutic grade (only) essential oils in my daily life to promote a strong immune system and healthy cells. Currently, I am taking some additional supplements for specific purposes. I worked out with weight training and cardio almost daily for over 20 years and discovered I was hurting myself; now I just practice daily yoga, yumana body rolling, and of course, gardening chores. I am a very spiritual person and I practice meditation and prayer. I read a LOT and always have about 5 or 6 books going. I read subjects like inspirational stories, building soil, plants, micro-nutrients, food preparation books, natural healing, etc. I find good health is the whole body, mind, and spirit. I make time for myself and relaxing in spite of all the work that remains on “the list”. I take time for my family and my hobbies. When I am doing my chores, I enjoy them and marvel in how well things are growing and how beautiful nature is. When interacting with people, I choose to spend my time with positive, thoughtful, caring, and uplifting people. I always have more questions about these subjects. Water with liquid minerals/herbal tea/juice/smoothies, 80% raw produce, probiotics/prebiotics/enzymes/supplements, herbs/essential oils, yoga/body rolling/gardening instead of weights/cardio, meditation/prayer/reading, family/hobbies, and lots more – phew, good list! Hi Phil I have been following your gardening blog for a couple of years now and find your information very useful for my gardening projects. Also, I have purchased some of your products since you ship to the U.S. now and I assume that you only sell products that are processed properly and are the best available. Your book is the first one I go to for gardening answers!I am 66 years old and am interested in eating, exercising, and living in a holistic way. I try to get exercise, but that has been a hit and miss , (especially in the summer cause I’m pretty active anyway). I watch what I eat most of the time as I know it is healthy, but I don’t have any real philosophy or approach that would bring these important things that you mentioned together as a holistic approach and so I would be interested in your findings. I remember reading in one of your blogs that you consumed some form of Bokashi as a way to optimize your digestive system, (if I remember correctly) and I know there are similar products available in health food stores, though I have not tried it myself. I look forward to hearing from you on this subject, also. Yes, I consume a version of the SCD Probiotics listed up in the article above, and I make my own kombucha, too. Will definitely want to talk more about fermenting on this new project. Thanks for sharing. Hi Phil,I’m vegan and don’t eat junk food — just lots of plants. For fats I eat nuts, avocado, and such found in whole foods but avoid using oil (although in restaurants I ease up if they can’t, as finding vegan is enough challenge.) I try to go often to cooking classes/demos at a local health food store, as well as on-line. That way I keep learning about food and how to make it sing. 🙂 My favorite nutrition advice is from Dr. Michael Gregor at “nutritionfacts.org”. For exercise, I practice yoga everyday, sometimes about 40 minutes, sometimes just 15 minutes when time is tight. I go to local dances often. The weekly dances are low intensity and go on about 90 minutes. The twice monthly dances are vigorous (and so fun!) and go on for 2 1/2 hours. Also I like to hike, go for walks, jog (just a little), do light weights, and follow some on-line classes for targeting different areas. I also have a little garden, but as you say — often it’s just pulling weeds and the basics. So everyday I do at least a little exercise and throughout the week I add in much more. For my mind I focus using a mantrum for about 20 minutes and I meditate (goal is silence, but you know how elusive that can be) 30 minutes a day. Plus I try to learn lots of different things. I’m learning Italian now, read, go to monthly lectures at our veg society, and enjoy trying my hand at arts — latest is wood carving, which I find very satisfying and will probably be a keeper in my life (you can probably tell I’m now retired.) I’m thinking of taking up archery — not for hunting, obviously, but just for focus, exercise, and pleasure.Question: How do I find a vegan boyfriend? Just kidding… I’d like to learn more from you and from the others here. What would you all like to teach me? Healthy vegan diet, yoga/dancing, walk/jog and weights/online classes, mantra/meditation, keep learning new things – thanks for sharing! I avoid gluten, and most dairy. The exceptions are butter, and some cheese. No milk, sour cream, yogurt. I try to keep the carbs low, but am not obsessive about it. I try to eat homemade fermented veggies, and I am trying to limit alcohol to once a week or so. I walk for 20 minutes most days. I don’t formally meditate, but when I walk, I let my mind wander and disingage from my current concerns. By the end, I am more focused than before. No gluten, little dairy, low carb, fermentation, limit alcohol, walking – thanks for sharing! John–I love your blog entries and often print them out and send them to my son, who is in prison for the next eight years. When he gets out he’ll know theoretically how to garden, and then he can work getting the experience.I eat fresh squeezed vegetable and fruit juices, nuts and lots of avocados. I like meat, but I limit it to once a week because the grass-fed naturally raised meat is scarce and expensive. I have chickens who give me eggs. I can’t eat them, though…LOLGardening is exercise as we live on the side of a hill, but I also use a recumbent bicycle and swim.As for my mind, I play Scrabble, sew, and write books on spiritual subjects.I have had lots of questions in the past, but I think I have found my perfectly balanced Bliss and am completely happy. Santiam Organics makes an ericoid inoculant that you can find online. Or find blueberries or their relatives in nature and take a few handfuls of soil from there (a blueberry grower may very well not have them in their soil, especially on a farm that’s sprayed with pesticides). dumb question but here goes– If i put some soil like you mentioned on roots coming out of the south of a plant, will ther ericoid spread to all roots (or should I dig dow in 3-4 different places in order to get good inoculation? It’s a great question. As long as part of the plant gets inoculated, the fungi should eventually travel around to the whole plant. And yet, if time allows, I would do just as you said and dig little holes in 3-4 places, just to be sure each plant gets inoculated. I eat mostly organic fruit and veggies. We are transitioning to grass-finished beef, free range chickens, and organic pork. I eat lots of grass-fed butter, avocados, olive oil and coconut oil. I eat gluten free so Paleo recipes are usually helpful. Many health gurus (ie Sally Fallon at Weston Price Foundation) encourage the consumption of liver. I like it but…I hesitate to eat it. Any experience? My garden is minimally successful. We rent so I am limited to containers. I grow kitchen herbs right now but I want very much to grow medicinal herbs, however I do not know how to properly harvest or dry any herbs, nor do I know how to turn them into medicine. Especially I am interested in learning about any medicinal herbs that help with heart disease and inflammation. Videos on how to make decoctions, teas, tinctures would be helpful. I am also interested in core exercise and low impact exercise. Organic food, gluten free, interest in medicinal herbs for heart and inflammation, core/low impact exercises. Thanks for sharing! Drying herbs is easy enough to learn, and making tinctures takes a little more effort, but is very rewarding. What about learning og which healthy foods are relaxing/calming and which healthy foods give energy.Amino acids , herbs and mood?Why does somone crave organic butter?What foods contain GABA? Eating: One of my favorite dishes is oatmeal cooked with cinnamon and apple juice. After cooking I add vanilla flavored whey protein powder, milled flax seed, and fruit. Sometimes I add 1/2 cup of Cheerios. This morning the fruit was blueberries. Later it may be some strawberries or perhaps an orange or banana or pineapple. In season it could be fresh cut up figs. I mix this together after adding lemon, pomegranate or grape juice. If my berry project works out, it will be raspberries, more blueberries, blackberries, grapes and figs for my oatmeal.Exercise: I can be found hitting tennis balls at the local courts most evenings. I get to the courts by bicycle. I do a lot of bicycling.Gardening: My current garden project (started last year) is to grow berries. I have started multiple varieties of blueberry and raspberry as well as some black berry plants, some fig trees and one grape vine. I selected blueberry and raspberry plants from a list of early, middle and late bearing varieties so as to get as long a fruiting season as possible. I am anticipating the day when I will be eating the fruits of my gardening with my oatmeal dish.I have used a number of your ideas as well as others that I have researched to optimize plant health and growth.Question? : Extra Sun: I have a limited space (especially sunny space) for my plants. I am using silver plastic mulch to hopefully increase sun exposure. I have read a couple other ideas that I have not implemented. For instance, I read somewhere (I can’t find it now), that a small solar device implanted in the soil next to a plant will help it to grow in limited sunlight. I also read an electronic book by George Starr White MD that talks about using copper wires connected to pipes, metal fences or grounded copper rods which provide energy to plants. Have you ever heard of experiments that show that this extra energy might be a significant supplement to the sun’s energy so that a less than ideal spot might be used to grow plants requiring a lot of sun? Is paramagnetic energy said by anyone to help? Have you got any other ideas? Oatmeal with lots of goodies in it, tennis/bicycling, gardening – thanks for sharing.I know of people who are using electricity successfully. I’m not sure how that relates to the sun’s energy, but it’s doing something when done right. I haven’t heard of using a solar device next to the plant. Paramagnetic rock dust can sometimes help quite a lot. Improving the soil nutrient balance (with a good soil test and subsequent fertilization) as well as the biology (with compost and inoculants) will help too. Hai Phil,Thanks for your reply regarding sea water. I still wish to know the technique of making concentrated sea water. I live couple of kilometers away from sea. But, I wish to introduce this product in my state of India. For that, I wish to manufacture it. Cool, good idea – you’ll want to contact someone who manufacturers it to see if they can help. Proteins/vegetables/whole grains, avoid sugar, changing self-talk habits – thanks for sharing. The toxicity concerns around kombucha are generally myths – it’s not a magic bullet, but can be very helpful for some people. I’ll definitely be getting more into it at some point. Thanks for asking. Hope this gives you lots of starting points:Diet: Weston A Price foundation guidelines to sourcing and preparation of food. Fear no fat, if traditionally prepared from a well-sourced animal/plant. Exclude foods you are sensitive to; this will differ for every person and also change over time and with the seasons. Takes a while to tune into for yourself if you’re not used to it. Consider trying Paleo/Gaps for a few weeks and then adding back in other foods to check your compatibility with it. Other authors with strong research you maybe interested in: Russell Blaylock, Nora Gedgaudas, Natasha Campbell-McBride, Joan Mathews-Larson, Stephanie Seneff, Josef Mercola, Allison Siebecker (siboinfo.com). Also interesting: Mary T Newport (coconut ketones), TED talk by Terry Wahls (on mitochondria), and many more.Exercise: look up on mercola.com: slow but “high intensity interval training”, and combine with “intermittent fasting” (it’s not what it sounds like). Mind: Yoga, QiGong, Meditation, Walking. Find a discipline and a good teacher you feel drawn to learn from. There are several schools of each discipline that were especially developed for preventing and healing chronic health conditions. As with every other skill, the basics are very important and I heard that an ignorant teacher (or lack of a teacher) can mess up your nervous system inadvertently. Do your research, then try to be patient and trust your teacher. Quality fats and paleo approach, HIIT for exercise, yoga/qigong/meditation/walking – thanks for all the info! Great questions and what I’m also thinking about all the time these days. 1. I was vegan for 5 years but have reintroduced dairy, eggs (2/day!) and salmon in the hopes of increasing protein and decreasing carbs. I feel better. 2. I had my own business for 5 years http://www.growing4good.com but the digging and pounding resulted in slipped discs in my lower lumbar and shoulder tendinitis that won’t go away so I had to quit the garden biz, quit swimming, quit rock climbing, even biking hurts, so now I hike and aqua-jog and skate-ski in the winter. 3. The hiking serves as walking meditation. I’ve also started practicing lovingkindness mediation. I’m trying to slow down my lifestyle in general and increase my acts of kindness/decrease my impatience and negative thoughts. I’m about to begin working with a spiritual director (Catholic) and volunteer more. These are for obviously the mind & spirit. Vegan reintroducing animal products, aqua jogging/skate skiing/hiking due to injuries, meditation/positive thinking/volunteering – thanks for sharing Meighan! Have you heard of Liposomal Vitamin for your health? Check the internet http://www.livingherbalfarmacy.com for directions on how to make your own and what to use it for. Liposomal Vitamin C will cure just about any infection, improve heart health, can cure some cancers. Hi Phil! I’ve learned a lot from you over the past year. In return, I’d like to help you out, so here is my take on your questions:1) Eat and Drink…I am a type 1 diabetic, so I stay away from sugars as much as possible. I drink water, tea, and almond or 1% organic milk ( no juice, soda, or alcoholic beverages). I eat as organically as possible in my area..fruits and vegetables, nuts and seeds, whole grains, beans, and organic fish, chicken or beef every once in a while when I feel the need for a little extra protein.2) Exercise… I recently joined a gym to have access to a swimming pool and yoga classes, also lift weights, but can’t walk much due to neuropathy and arthritis.3) Mind… I just retired as a science teacher, so I am trying to catch up on some reading, am learning to sew, and learning Italian. I also do as many puzzles as time allows and keep up with friends and family.4) Questions…Why can’t we get the government (US) to identify which foods are GMO? What is the best way to get more varieties of heirloom seeds? Other than “rooster juice” what is good for arthritis in the knee? Many thanks for all the knowledge and ideas you share. Organic whole foods/low sugar, swimming/yoga/weights, reading/hobbies/learning – thanks for sharing Paula, and thanks for the great questions! I enjoy you stuff Phil.I eat whole grains, beans, fruits and vegetables and very small amounts of nuts. I avoid eating overly processed food, any grains that are not whole, all oils, refined sugars, and added salt. I drink 4 or 5 glasses of wine a week. I don’t drink fruit juices. I eat greens with every meal. I’m 70.I do Bodyweight exercises 3 times a week. I read, meditate (Zazen) and do Lumosity. An old Chinese saying. If you wish to be happy for a few hours, drink wine until you head spins pleasantly; if you wish to be happy for a few days, get married and hide away; if you wish to be happy for a week, roast a tender pig and have a feast; if you wish to be happy all your life, become a gardener.”I don’t have any questions. It is interesting to see what others are doing. Focus on whole foods, especially greens, and a bit of wine, bodyweight exercises, mediation and lumosity. Love the proverb – thanks for sharing. Hai PhilI enjoy your gardening lessons. Thanks. May I know how to make concentrated sea water from ordinary sea water? Can you believe that I ordered some seeds and grew them out to find it was not the plant I ordered, yep, but now I can sooth malaria :)) oh well. ahem- I use hot peppers for bleeding hemroids and it works, cocoa powder in coffee seems to help too. Hot chocolate :)- Smells always seem to lift my spirits, like cracking a mint leaf open and smelling it, or mixing it with some stevia, garden bubble gum. Whats the easiest, least expensive way to get the essences from safe to use plants?-Here’s a doozy- Catfish–one of the healthiest fish you can eat right? They have to be caught. Other than anise and garlic and vanilla and hot peppers, what plants might be a good additive to add to fishing baits to attract them or other fish? Unique questions John – thanks very much for sharing them. I enjoy and appreciate your gadrening information, so thanks,again. Meanwhile, regarding your new and cool project, I avoid all processed foods, carbonated drinks, fast food and GMOS. I try to eat only organic, which in this present food system can be a challenge. I make everything I can from scratch, with ingredients I know, and if I can’t find raw milk ( a big challenge) I make sure it is organic and minimally “pasteurized”. I make my own mayo, mustard, Worcestershire sauce, salad dressings, yoghurt, ice cream, etc. and ensure I get a good balance of fresh veges and fruits to go with good quality protein, and use natural anti-oxidants in my cooking (like turmeric, ginger, etc.) and healthy oils like coconut, flax and real olive oil (many adulturated versions out there) every chance I get, and shoot to use less wheat and more oat and alternative flours, when possible. Right now, my exercise is just getting things done around the house, and throwing the ball regularly for my pups. As resources for you to tap, I would recommend Jon Barron, Dr. Sears and GreenMedInfo.com. Enjoy your new project. Thanks for the links Veronica. Seems like we’re seeing a theme here with whole foods, homemade, organic/non-gmo, etc. being mentioned often. Raw/organic/paleo, water and tea, walk/bike/dance, conversation/reading/games – thanks for the great list Debbie. I agree, I think for a lot of people, learning what to do is the easy part – it’s sticking to it that can be tricky. For food, I only eat from scratch and organic when necessary. I use the Clean 15 and Dirty Dozen list put out by EWG. I mostly drink filtered water from my tap and maybe 100% fruit juice (organic) or green tea. About the only place I shop in is the organic/nutrition center at my store or an organic farmers’ market stand or farm. Meatwise, I mostly eat Alaska wild caught sockeye salmon (the only one that can’t be farm raised), occasionally tuna sustainably harvested. From time to time I have organic chicken or buffalo meat. Only organic in that department. Organic eggs makes a nice dinner occasionally. And, of course, the legumes via soup. Not a whole lot of sugar, and when I do, it’s evaporated cane juice or honey. I also make my own goat milk yogurt which I have every morning on my whole grain granola along with blueberries and raspberries. I sprinkle some raw chocolate nibs on top. Try to have raw almonds everyday and also the “healthy” portion of 72% dark chocolate (1 oz). (Isn’t life rough! )A good hike in the woods takes care of two in one. It’s works wonders for my peace of mind and reducing stress; and is also an excellent source of exercise. I’m 71 and not a single risk factor, so I assume I’m doing something right. Good luck with your quest. Organic, homemade food, filtered water/tea, walking in the woods – thanks for sharing Gail. 1. What do I eat and drink? – I drink mostly coffee, tea and water, not a fan of fizzy drinks and alcohol, but I do drink them in moderation on occasion. 2. What do you do for exercise? – I gym, hike and fortunately for me most of my cousins are still kids, so I often play with them. 3. What do you do for your mind? – I’m a scientist, so my mind is busy solving and puzzling and arranging the whole day long, but to unwind I enjoy listening to music, watching good films or sitting outside drinking coffee with friends and family.4. What questions do I have about these things? – Well, I seem to get a handle one or two of these aspects of life at time, and then somehow the other is terribly neglected. So my question – what advice or tips would you/any of these experts suggest on maintaining a balance between these three? Great list Juan, and good question – thanks for sharing this. I use zero sugar, low carb, high coconut oil (150ml/day) and make my own Sauerkraut. My last batch is just perfect, justifying my purchase of a sauerkraut crock.I do a similar fermentation for my garden. I ferment all my food scraps with Bokashi culture since a few months ago. I switched over to square-foot gardening at the same time. I’m using one-square-foot containers with the bottom cut out and each one has two inches of yellow builder’s sand (My local sand is devoid of nutrients) one inch of Bokashi fermented scraps, half an inch of clay/silt soil improver, and 2 inches of sifted compost.It’s mid-winter here now, and only radishes and pak-choi grow when I plant them, but the soil will be improving until springtime as the Bokashi culture gets to work.Although my exercise is just gardening and walking, my body-fat percentage varies between 12% and 14% so the idea of getting my energy from coconut oil seems to be working. At my age more vigorous exercise than gardening is out of the question. No sugar, low carb, high coconut oil, fermented foods, gardening and walking – thanks for sharing Ian! Turned around our family diet with the help of the Daniel plan (Saddleback church, loads of free videos and recipes), discovered the whfoods.com website and the excellent book that goes with it. Discovered that if I drop bread from the menu I eat more vegetables. Eat local, bio if possible and as little processed foods as possible. For exercise: use the car as little as possible! I keep quail and the eggs lowered my husband’s hayfever symptoms. He has also started JuicePlus. Less bread = more veggies. Local, organic, whole foods, eggs, juiceplus – thanks for sharing Susan! I am 38 and I am a super happy person. I just got married (for the first time) last year. But I was happy before that. My secret: Be kind, don’t judge, be social, get outside, and always make good decisions. My husband and I couldn’t be happier. We are respectful to each other, we don’t criticize, we don’t fight. We both love to garden and watch the insects and birds in our yard. We have several pets and he has 2 wonderful children. I actually just stopped eating beef, chicken, and pork about 2 months ago. And really limit bread. I have no desire to eat those meats. Feels great and I am in great shape now. Thanks for sharing Jodi – be kind, don’t judge, be social, get outside, and always make good decisions, cut out certain meats and bread. Morning Phil! Hope this day finds you well. I’m a Naturopath/Master Herbalist so my responses will probably be along the same lines as most. My diet is clean (no drinking/smoking) with plenty of organic fruit & vegetables, some lean meats & organic dairy. My breakfast & pre-workout meals are always a protein smoothie with a banana included. I use the herbs & vegetables I grow as my medicine, when feasible. Exercise is mountain biking, wreck diving, Krav Maga, weight training, hiking & Pilates. These also have a therapeutic effect on one’s mind in their own regard. For my mental as well as spiritual well-being, the Bible & prayer time comforts & encourages me when I need it. I have an evening tea ritual in my moon garden which is a nice ending to a day. I also like to stargaze when the weather permits or go for long walks by myself on the beach. There’s a certain serenity only nature can provide.Wanted to give you a heads up on the progress of my organic veggie garden: Thanks to the advice in your videos, this is the first year in how many that I’ve gotten a bumper crop of tomatoes, cukes & corn 🙂 ! So for anyone reading this: if you’re on the fence about Phil’s methods, let me assure you they DO work! It’s harnessing the power of nature to do for itself what it was naturally created to do using its own tools. It might be a bit more work at first, but the payoffs are worth it. Your soil is naturally replenished, your plants will be healthier, stronger, happier, & more productive & you become a more efficient, wiser gardener in the process. Thank you Phil for taking the time to share your knowledge with us in the hopes of creating a greater awareness about the importance of organic gardening. Happy growing everyone! Hi PhilOur garden/food forest offer us wild foods and medicines and we have avoided dr’s for years thanks to learning how to use them. We gather wild fruit in season, too. I preserve/ferment everything I can so that even in our harsh Quebec winters we can eat something wild every day. Nourishing herbal infusions of oatstraw or nettle for minerals, good fats, good salt, seaweed and sunshine instead of vitamin pills or “herbal supplements” in capsules. What we can’t grow or forage ourselves we try to buy from local organic farmers but if we can’t, we don’t sweat it. A little supermarket food now and then won’t kill us. I bake our bread, make bone broths and hang the laundry outside or near the woodstove to dry.Exercise? Should probably do it more formally but the above lifestyle keeps us pretty active so we don’t sweat that too much either. We live pretty clean compared to some but indulge ourselves without guilt when we feel like it. Husband is about to take early retirement, I’ve been a housewife for years now. Income is about to take a hit but we deliberately bought a small house and paid it off early so we wouldn’t be slaves to the mortgage all our lives.Instead of fighting aging we’re embracing it. We avoid negative people and got rid of our TV.Just found this site, by the way, and like it. Your little food forest is adorable, may it be as much of a blessing for you as ours is! Thanks for sharing Christine – lots of good tips in there, especially using wild foods as medicine and doing all of the fermenting/preserving. Little to add that hasn’t been said below… all genuinely good advice, and thank-you. I ‘stumbled’ on your internet site a year ago and continue to return… not only for your depth of knowledge about gardening, but even more-so for the inspiration it gives to watch and listen to a young man truly wise beyond his years. Thank-you and your readers for restoring my faith that there are still some younger that recognize and value the true, perennial wisdom shown us eternally in Nature. Thank-you all… from the rest of us. Thanks Ed – that really means a lot (especially today!). Hi Phil, as for nutrition I am doing the Raw lifestyle. If it comes from my garden or a garden close by that is also organic I will eat it. I consume raw seafood (sashimi), no dairy or grains. Lots of seeds, nuts (soaked), berries… Most food from the garden gets frozen and converted into green smoothies or goes through the dehydrator for snacking. Exercise – walking, kayaking, gardening, horseback riding, swimming and rock climbing. These outdoor activities are also my sanity. Life is great! Raw, organic. No dairy/grains. Lots of exercise and outdoor stuff. Thanks for sharing Debra! I try to eat organically have even been able to throw my blood pressure pills away, do yoga & meditation walk our dog’s, drink water & wine with supper. An information about tweaking a program will be great. I am trying to reclaim an allotment which is one bed of couchgrass, thistles, dandelions and tanzy. The previous owner covered it with plastic, weighted it down with stones and covered that with soil. The weeds thrived. So now I would like to know the most effective organic way to get rid of the couchgrass (elymus repens) which is everywhere. I have clay soil mainly with some silt. It is hard work and retains the water when it rains and is like concrete when it is dry. I use compost, urine, coffee grounds, pulverized eggshells and weed tea. Local types of comfrey (symphytum officinale) grow naturally. The ones in the area have sky-blue, purple and beige-pink flowers. Since I find them attractive I seldom use them but use weed-tea instead. We have no electric at the alottment area nor do I know where to find molasses in Stockholm so I just put the weeds in a bucket, add water, cover it and leave it for a couple of weeks before diluting it and watering with it. I have been very happy for many years now even though this year has been full of set backs and infirmities. It’s quite a challenge to get rid of couchgrass. I was successful once by digging up all the soil and putting it through a screen. Of course that takes a long, long time. 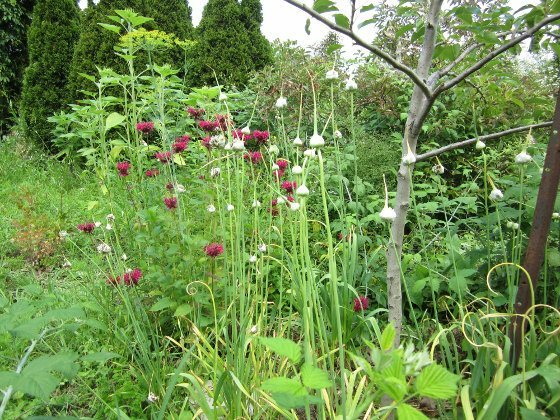 In the end, the easiest thing is to plant other plants to compete with the grass and make friends with the grass that does sprout, along with a little hoeing to keep it under control. As long as it doesn’t take over, it will at least provide benefits for the soil. Phil,What do you think about applying wood ash?? I will have access to an abundance how much should I use? Wood ash is great if you know your soil needs both calcium and potassium, but if you already have an excess of either of these minerals, you don’t want to apply more (especially potassium, too much of which can really tighten up/compact your soil). I often suggest that people can use 3-4 pounds of calcium per 1000 square feet without needing a soil test, but not more than that unless a soil test says you need it. Hi Phil,I just recently rediscovered your blog and so am coming a little late to the conversation.A few months ago I started eliminating processed sugars, grains and most dairy from my diet. In the process, I’ve lost a little over 50 pounds since September when I started getting serious about it. I usually eat a little protein with every meal, but the bulk is heavy on vegetables with some fruit and nuts, mainly walnuts. For protein I like wild caught Alaskan salmon and sardines and some chicken and beef. I try to buy organic veggies and fruit where ever and whenever available along with free range eggs. My worst remaining food habit is probably coffee, still love it and undoubtedly still drink too much of it, but have started adding green and herbal teas to the mix. Almost everything I eat is now cooked fresh and from scratch by me, although I do rely on a few canned and frozen items. I will dine out occasionally by myself or with friends but stick to salads and allow myself a couple of adult beverages per week.For exercise, I’ve always preferred walking but am now adding about 20 minutes of HIIT (high intensity interval training) everyday. For my mind, I read everyday. I enjoy woodworking, designing and building things both for myself and as gifts for friends and family. I sort of specialize in outdoor furniture, picnic tables, benches, chairs etc.I’ve been wanting to landscape my yard, my house sits on a large double lot just at the edge of a small town in Indiana. (Pop. of about 400) There’s farmland right behind my property, with a narrow swath of trees separating us. I’ve been in a kind of paralysis about landscaping, unable to nail down just exactly what I want, so every year I plant a few flowers and some tomatoes, promising myself to do better next year. Now I’m spending this winter actually listing what I want and making drawings, layouts and designs. I’ve come up with a 5 year plan, with part of the hardscape and ornamental and fruit trees going in this spring, the rest of the hardscapes coming in the following 2 years along with raised vegetable beds and flower beds. I want to put in mostly perennial fruits, vegetables and flowers, and sow my annuals in the vegetable beds, with annual flowers going where needed for color and eye appeal.Well, this is getting pretty long for a blog comment so I’ll close with that I’m pretty happy where my research has led and the results I’m getting from the nutrition and exercise aspect, though always open to new thoughts and ideas. Where I feel the biggest need is in the area of focus and concentration. Too easily distracted by bright, shiny objects. Getting better about it, but still an area that needs much work.Can’t even begin to tell you how much I’m enjoying your blog and YouTube channel. Thanks for all that you share and do. I would like to know how to apply your fertilizer in smaller portions, like for potted plants, plants growing indoors? I was interested in buying your three recommended beginner fertilizers. If I can use small amounts, what is the “best used by” duration? Hi Khanit, the dilution rate depends on the product, but it’s often 1:50, so about 5 Tablespoons of fertilizer mixed in 1 gallon of water when you’re watering your plants. You want to use this the same day you mix it, but the undiluted fertilizers can be stored for at least a couple of years.